Harry Potter Author JK Rowling to Construct Two Blue Forest Treehouses in Edinburgh! JK Rowling has thrilled millions of children around the world with her Harry Potter books, but now the multi-millionaire is treating her own kids to two magical tree-top turrets custom-built by treehouse designer extraordinaire Blue Forest. Rumored to cost around £250,000, the treehouses are so big—each one 40ft in height—that the author has had to seek planning permission from Edinburgh Council. Blue Forest, a company based in Tunbridge Wells, Kent are also behind the ever popular Eco-Perch treehouses. Appropriately, the treehouses to be built for JK Rowling resemble turrets from the famous wizarding school Hogwarts; their fantastical appearance will however hide a more luxurious interior. 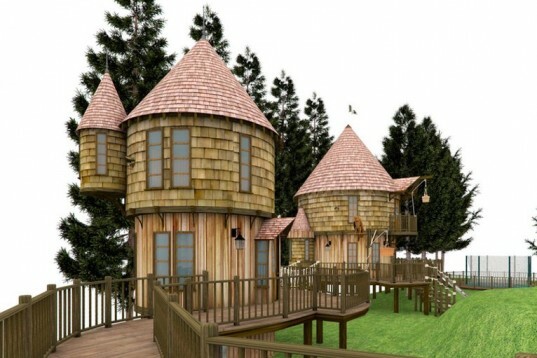 According to The Scotsman, each treehouse will be equipped with secret tunnels, trap-doors and a spiral staircase, along with a rope bridge to connect the two turrets. The treehouses will be built in the garden of Rowling’s north Edinburgh home, a property which she bought two years ago. The author, who is estimated to have a fortune of £560 million, has even had to receive planning permission to demolish a £1m, 1970s-style house she bought next door in order to increase the size of her garden. She has also won approval to build a summer house that is said to resemble Hagrid’s stone hut. 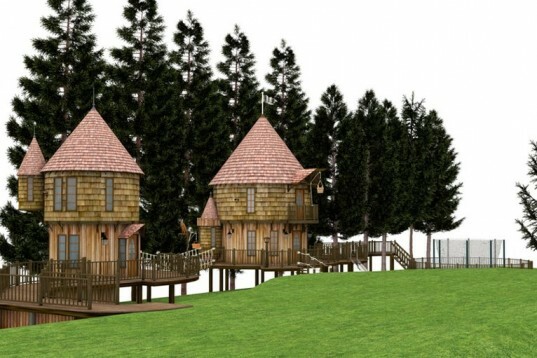 The treehouses will feature Harry Potter-specific embellishments—such as owl perches—while a “nature box” will be built into the roof to provide nesting space for birds. A trampoline will also be constructed on a special deck on the approach to the treehouses. Blue Forest’s managing director, Andy Payne told reporters: “Treehouses have always been a symbol of imagination and creativity.” The company’s basic models start at £20,000, but the firm admits there is no limit to what their clients can request.